This expands the existing Pacific Remote Islands Marine National Monument from 83,000 square miles to 490,000 square miles. To protect the whales, seabirds, sea turtles, fishes and corals in this region of the central and western Pacific Ocean, commercial fishing and mineral extraction will now be prohibited in this national monument. 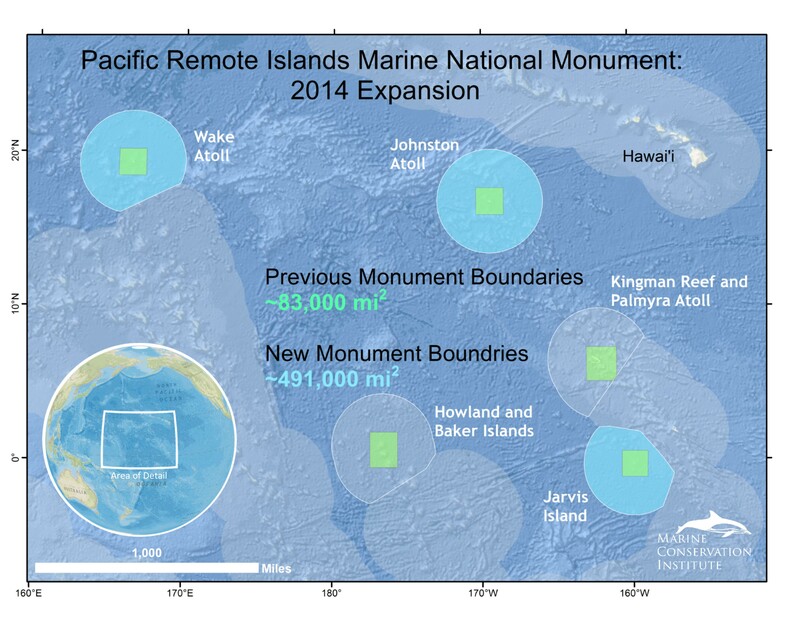 The expanded monument is now the largest protected area on the planet (land or sea). It encompasses the seven islands and reefs of Wake, Johnston, Baker, Howland, Kingman, Jarvis and Palmyra, as well as the ocean around them. The Pacific Remote Islands Marine National Monument falls within the Central Pacific Ocean, ranging from Wake Atoll in the northwest to Jarvis Island in the southeast. The seven atolls and islands included within the monument are farther from human population centers than any other U.S. area. They represent one of the last frontiers and havens for wildlife in the world, and comprise the most widespread collection of coral reef, seabird, and shorebird protected areas on the planet under a single nation’s jurisdiction. On January 16, 2009, the Secretary of the Interior delegated his management responsibilities for the monument to the Fish and Wildlife Service through Secretary’s Order 3284. Through this order, the Secretary extended the boundaries of Howland Island, Baker Island, Jarvis Island, and Johnston Atoll National Wildlife Refuges to 12 nautical miles from the mean low water line of each island. He also established a Wake Island Unit of the monument to be managed as a unit of the National Wildlife Refuge System out to 12 nautical miles from the mean low water line of the islands, with the Department of the Air Force continuing to manage the emergent lands as described above. Recreational and sustanence fishing allowed for military members around Wake Atoll. "The Secretary of Commerce, through the National Oceanic and Atmospheric Administration (NOAA), and in consultation with the Secretary of the Interior, shall have primary responsibility for management of the monument seaward of the area 12 nautical miles of the mean low water lines of Wake Atoll, with respect to fishery-related activities regulated pursuant to the Magnuson-Stevens Fishery Conservation and Management Act (16 U.S.C. 1801 et seq.) and any otherapplicable legal authorities. The Secretaries of Commerce and the Interior shall not allow or permit any appropriation, injury, destruction, or removal of any feature of this monument except as provided for by the proclamation and shall prohibit commercial fishing within boundaries of the monument. However, the Secretary of Defense shall continue to manage Wake Atoll, according to the terms and conditions of 1972 Agreement between the Secretary of the Interior and Secretary of the Air Force, unless and until such Agreement is terminated. Until termination of the 1972 Agreement between the Department of Defense and the Department of Interior- the Department of Defense will continue to management the terrestrial portions of the Wake Atoll until jurisdiction of the Atoll is returned to the Department of the Interior."